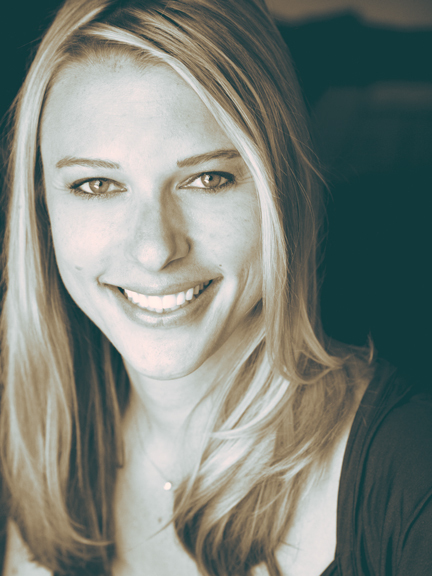 Originally from Northern California, Jennifer graduated from UC Santa Cruz with a degree in French and Linguistics and relocated to Los Angeles in 2002. After joining Ellen McCormick in 2004, Jennifer earned her broker’s license, bringing a wealth of experience, knowledge and insight to complement Ellen’s real estate practice. Having lived many places across the city, from the Fairfax district to the Palisades, Jennifer has become enamored with LA’s unique neighborhoods, their cultural and architectural diversity and the stories they tell. One of Jennifer’s favorite aspects of real estate centers on not only connecting with her clients personally, but then helping them to envision and create their own story in their new home. Jennifer’s story is currently set in the Mid-City area of Los Angeles with her husband and son, where they live in a beautiful 100-year-old Craftsman home.
. A NETWORK OF EXCELLENCE . With over 30 years in the business, we have developed relationships with some of the best professionals in escrow, title and a whole array of service providers. We have a strong presence within the brokerage community and enjoy an excellent working relationship with our peers. When you hire us, we act as your liaison within the brokerage community where we put you and your interests first. Over the years, Jennifer and I have cultivated a rich fabric of experience, expertise and relationships. It is the great joy and benefit of this profession that allows us to embrace new clients and discoveries and weave them into our tapestry’s story. A belated THANK YOU for all of your hard work in helping us sell our home. You were invaluable throughout the process and ensured a timely and smooth closing… You also went above and beyond when we hit some turbulence… We are very grateful to have you in our corner. We are feeling like we delivered a total coup, in every sense – thank you so much again for everything you and Jen did to make it all happen, you are an amazing team. You really have been quite instrumental in our California adventure! You are not only the best real estate agent I have worked with, but also, and most critically, a wonderful human being. 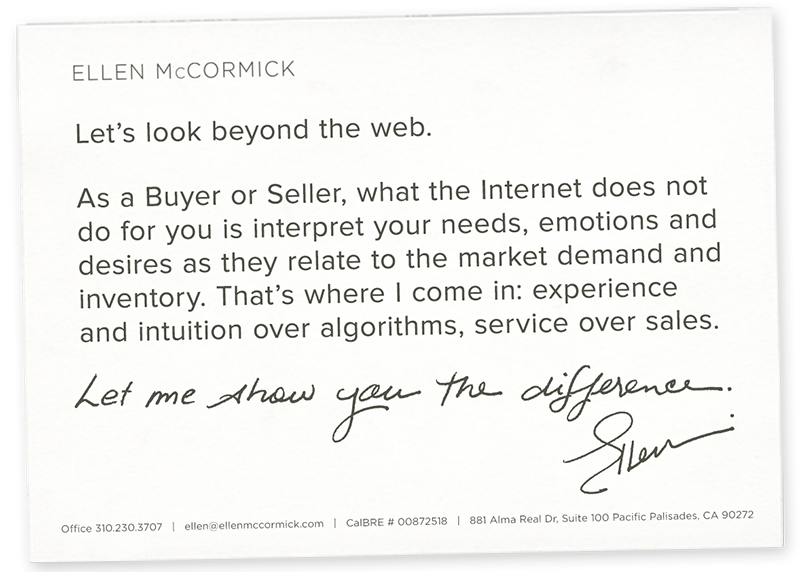 Ellen McCormick was the most inventive, patient and diligent realtor we have ever worked with. She was a joy to be around and her enthusiasm for our house and our needs never wavered. We have and will continue to recommend her to our friends. On behalf of my wife and myself, I am writing this letter to compliment your firm for the incredible job performance by Ellen McCormick. We were so impressed with her experience and skill regarding the listing of our home that we engaged her services for the purchase of our new home in order to have her wisdom and skill on our side. Ellen is incredibly honest, genuine and straightforward. She is polite and diplomatic, but she can also be aggressive when necessary. With the utmost enthusiasm, we would recommend Ellen to anyone who was searching for an agent to sell, lease, or purchase a new home. She is an agent that you are privileged to have on your team. Ellen, you are amazing, so smart, so talented, so calming and such a lovely person in total. We won’t let you get rid of us! I am afraid Matt will just want to sell our new house so he can work with you again! We are both really grateful for all your guidance, compassion and support. I will keep you on speed dial! Thank you very much for everything you have done for us. Given the panic and stress of buying a new home…I could not have been in better hands, nor had more professional care than I did with Ellen McCormick. Every step of the way, from inspections to financing and to the closing, Ellen earned my trust, my confidence and my friendship. And when it came time to sell…Ellen delivered multiple offers from qualified buyers and my home sold quickly and easily. She is the only real choice for any home buyer or seller. 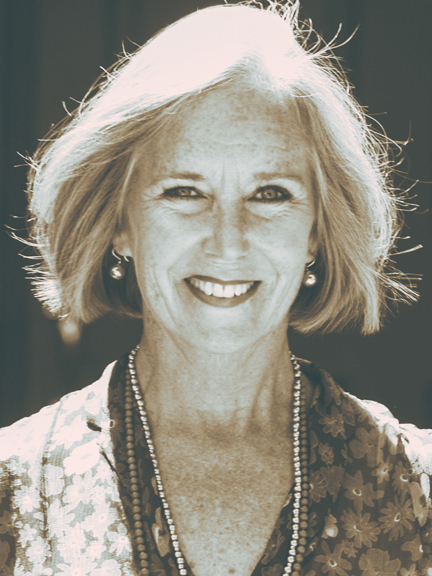 Ellen McCormick is a broker – a person – of exceptional taste, wisdom, and integrity. She represented me in the purchase of a beautiful Spanish gem on the Chautauqua rim, navigating through a bidding war and single-handedly assuring that I not only got the house, but also bought it at the right price… When it came time to sell, I made only one call – to Ellen. She deftly orchestrated and completed the sale at my desired price. Ellen is grace under pressure – whether buying or selling, there is no one better to have in your corner. Ellen’s abilities are numerous, but it is her devotion to her clients that is most impressive. Her integrity, professionalism and support are never wavering and she guided us through the purchase and sale process with an unsurpassed, deep and thorough knowledge of the local real estate market. Having someone like Ellen on your side to walk you through the real estate landmines is a must. She’s the one you can trust to make sure that you’re getting the very best deal possible on all fronts.